Dunkirk - Nolan's extraordinary, explosive World War II epic is maybe his best film. Nolan’s response has been to deliver perhaps his finest film to date. A shattering vision of warfare from a master filmmaker, capturing the horror of the retreat of the British Expeditionary Force in the first year of World War II. Even with the director’s lengthy movies there is an economy to his storytelling. Here he delivers his shortest film since debut movie Following. But, over 106 lean minutes Nolan expertly orchestrates three different plot threads that approach his subject by land, sea and air. Timelines intersect as the crisis escalates in an incredible story of survival against a formidable enemy and a cruel sea that is both the route home and a deadly obstacle. All told without cheap sentiment but brimming with compassion for the men (many still wet behind the ears lads) trapped on the vast, open beach. The film’s starting gun is a deafening crack of rifle fire that sends raw recruit Tommy (Whitehead) running headlong onto Dunkirk’s sands. He discovers the nerve-shattering wait to board a ship home, on the long, exposed pier christened The Mole. While listening for the banshee-like screech of an approaching German Stuka ready to strafe cowering soldiers or bomb rescue ships. In England, Mr. Dawson (Rylance), his son Peter (Glynn-Carney) and Peter’s friend George (Keoghan) heed Dynamo’s call and take their modest fishing boat to aid with the evacuation. 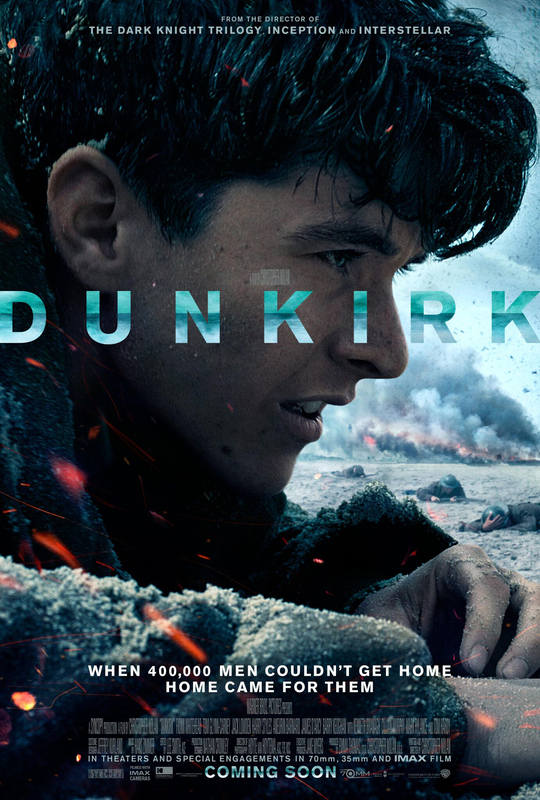 En route they pick up Cillian Murphy’s shell-shocked shipwreck survivor (billed only as “Shivering Soldier”), terrified at the thought of returning to Dunkirk. Above them, Spitfire pilots Farrier (Hardy, back behind a mask after The Dark Knight Rises) and Collins (Lowden) follow their flight leader across the Channel to engage enemy planes targeting boats sailing for the stranded soldiers. Dunkirk may run a swift hour and three quarters, but you will be in awe of how much writer/director Nolan packs into his run time. A film as much experienced as watched, it utilises cutting edge camera work, sound design and large scale, largely practically achieved special effects to place the audience on the beach, aboard the boat, in the fighter plane. Characters are defined by how they act in the moment and react to events around them, danger and death coming from every direction in a place where even the sea can burn. And Hans Zimmer’s extraordinary score flies beside or dovetails with sound designer Richard King’s surreal shrieks and rumbles. Both perfect accompaniment to Interstellar cinematographer Hoyte van Hoytema’s stark visuals, delivered in Nolan’s beloved 70mm and IMAX. High command is represented by Kenneth Branagh’s Naval Commander Bolton, stiff upper-lipped and a beacon of leadership as bombs fall and ships sink. A more tremulous authority figure is James D’Arcy’s Colonel Winnant, incredulous that civilian boats are arriving rather than naval destroyers. Among the younger cast, the unknown Whitehead is a revelation as the symbolically named Tommy, his sunken cheeks and serious eyes a result of having witnessed too much too soon. Even One Direction’s Harry Styles fits his surroundings in an unflashy performance that should satisfy fans and naysayers alike. German forces are kept offscreen, confined either to fighter planes or unseen riflemen taking shots at soldiers. Dunkirk has been done before on film. Back in 1958 with Leslie Norman directing John Mills and David Attenborough in a film now dated but boasting powerful moments. 2016’s Their Finest depicts the making of a Dunkirk propaganda film during World War II to boost morale, echoed here in a newspaper opting to “print the legend” about one character’s fate. But, Nolan’s touchstone movies are Stuart Cooper’s essential 1975 D-Day movie Overlord and The Battle of Algiers for its reportage style aesthetic. Few films though have captured the hellish spectacle of warfare. Or the Dunkirk Spirit. A timely reminder in this age of Brexit and distrust that Britain is at its best when going to the aid of those in need with minimal fuss (and as witnessed on Mr. Dawson’s boat, a full kettle of tea). A defiantly British film, it will be fascinating to see what other countries make of this. Hopefully they will embrace it as the work of a world class storyteller. And fellow directors will heed the call to inject genuine emotion and daring back into summer blockbusters. And keep that duration below two hours. Time will tell if Dunkirk redefines the depiction of World War II as Saving Private Ryan did in 1998. But, we’re calling it now – next stop, Oscars.